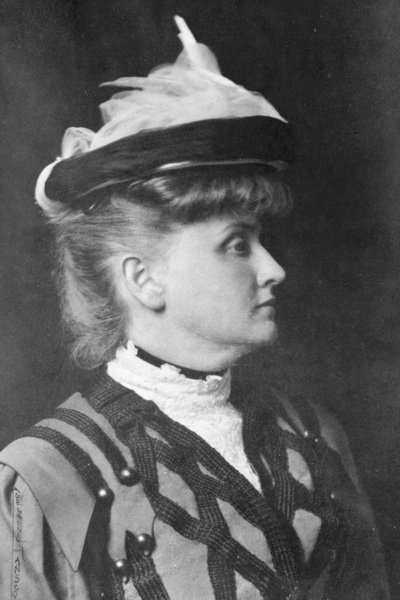 A prolific American novelist, short story author and early feminist, Gertrude Atherton (1857 - 1948) cut a strong and often controversial figure as she made her way in California and in the literary world. She is best known for a series of novels based in California including her 1923 work Black Oxen, which was made into a silent film. That novel's story line follows an aging middle-aged woman turned young again by a miraculous glandular therapy. Her novels and stories often feature strong female characters forging independent lives. Atherton's gothic horror story, The Striding Place is a standout to be enjoyed by all short story readers. Gertrude Franklin Horn was raised by her maternal grandfather, who insisted she be well read, after her parents separated when she was two. George Atherton, who was courting her mother, became more interested in her daughter, Gertrude and they eloped in 1876 to live on his estate with his domineering Chilean mother, in what became Atherton, California. Gertrude lost her son to diphtheria and her husband died at sea, so she was left needing to support herself and her young daughter. Writing was her answer. Her family ostracized her when they discovered she was the author of the serial The Argonaut in 1882, published under her pseudonym Asmodeus. She published her first novel, What Dreams May Come using the name Frank Lin in 1888. She left her daughter to be raised by her grandmother while she wrote in New York. She wasn't impressed by the looks or writing style of the young Oscar Wilde, whom she met while visiting London. Atherton returned to California after her grandmother died in 1890 to resume raising her daughter, began writing for The San Francisco Examiner and carried on a supposed love-hate friendship with Ambrose Bierce. Atherton preferred California to eastern literary circles, and became well known promoting its cultural identity, particular the romantic Spanish and Mexican influences that define its history. She advocated social reform and was a founding member of the Writer's League of America. Atherton died of a stroke in 1948 in San Francisco.